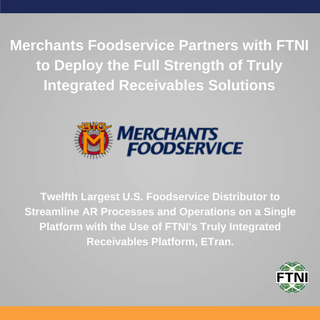 Twelfth Largest U.S. Foodservice Distributor to Streamline AR Processes and Operations on a Single Platform with the Use of FTNI’s Truly Integrated Receivables Platform, ETran. OMAHA, Neb. 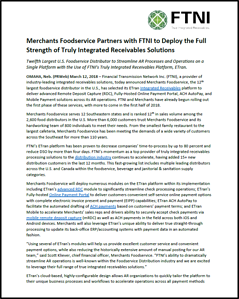 (PRWeb) March 12, 2018 – Financial Transmission Network Inc. (FTNI), a provider of industry-leading integrated receivables solutions, today announced Merchants Foodservice, the 12th largest foodservice distributor in the U.S., has selected its ETran Integrated Receivables platform to deliver advanced Remote Deposit Capture (RDC), Fully-Hosted Online Payment Portal, ACH AutoPay, and Mobile Payment solutions across its AR operations. FTNI and Merchants have already begun rolling out the first phase of these services, with more to come in the first half of 2018. Merchants Foodservice serves 12 Southeastern states and is ranked 12th in sales volume among the 2,600 food distributors in the U.S. More than 6,000 customers trust Merchants Foodservice and its hardworking team of 800 individuals to meet their needs. From the smallest family restaurant to the largest cafeteria, Merchants Foodservice has been meeting the demands of a wide variety of customers across the Southeast for more than 110 years. FTNI’s ETran platform has been proven to decrease companies’ time-to-process by up to 80 percent and reduce DSO by more than four days. FTNI’s momentum as a top provider of truly integrated receivables processing solutions to the distribution industry continues to accelerate, having added 15+ new distribution customers in the past 12 months. This fast-growing list includes multiple leading distributors across the U.S. and Canada within the foodservice, beverage and janitorial & sanitation supply categories. Merchants Foodservice will deploy numerous modules on the ETran platform within its implementation including ETran’s advanced RDC module to significantly streamline check processing operations; ETran’s Fully-hosted Online Payment Portal to deliver customers convenient self-service online payment options with complete electronic invoice present and payment (EIPP) capabilities; ETran ACH AutoPay to facilitate the automated drafting of ACH payments based on customers’ payment terms; and ETran Mobile to accelerate Merchants’ sales reps and drivers ability to securely accept check payments via mobile remote deposit capture (mRDC) as well as ACH payments in the field across both iOS and Android devices. Merchants will also leverage ETran’s unique ability to deliver true straight-through processing to update its back-office ERP/accounting systems with payment data in an automated fashion. ETran’s cloud-based, highly-configurable design allows AR organizations to quickly tailor the platform to their unique business processes and workflows to accelerate operations across all payment methods and channels, from a single receivables processing platform. ETran’s agnostic, ‘plug-n-play’ nature works with existing banking and merchant processor relationships and supports efficient integration (batch or real-time) with any back-office system. All payment information is processed and stored on ETran’s fully compliant – PCI, HIPAA, SSAE 16 and more – Software as a Service (SaaS) platform. From humble roots more than 110 years ago in south Mississippi, Merchants Foodservice has grown into the 12th-largest foodservice distributor in the United States. Merchants Foodservice distributes wholesale food and beverages as well as restaurant kitchen supplies to 12 Southeastern states. More than 12,000 in-stock line items are available, ranging from frozen entrees, fresh produce and meats to cooking and cleaning supplies. Headquartered in Hattiesburg, Mississippi, Merchants Foodservice operates state-of-the-art distribution and warehousing centers in Jackson, Mississippi; Clanton, Alabama; Newberry, South Carolina; and Tifton, Georgia. More than 6,000 customers trust Merchants Foodservice and its hardworking team of 800 individuals to meet their needs. Learn more at merchantsfoodservice.com.